The solubility of this compound in sterile water is 50 mM. General tips for obtaining a higher concentration: Please warm the tube at 37 °C for 10 minutes and/or shake it in the ultrasonic bath for a while. Stock solution can be stored below - 20 °C for several months. In HIV-1-infected PBMCs, AY 9944 Dihydrochloride restored mitogen-induced as well as recall antigen- and superantigen-induced proliferation. After 2-week treatment, the percentage of dead CD4+ cells in HIV-1-infected cultures was comparable that in uninfected culture. AY 9944 Dihydrochloride also stimulated IL-12 and interferon-γ production by 2 ~ 12 folds. The relative enrichment of sterol in rafts from AY 9944 Dihydrochloride-treated rat brains (average 7.85 folds) was similar to that from the control group (5.44 folds), which implied that 7-dehydrocholesterol (7DHC) promoted raft formation in a similar way as cholesterol did. However, the protein profiles of rafts from AY 9944 Dihydrochloride-treated rat brains were markedly different from those from the control group. AY 9944 dihydrochloride is a selective inhibitor of Δ7-sterol reductase with IC50 value of 13 nM . Δ7-sterol reductase (Dhcr7) is an enzyme and plays an important role in catalyzing the production of cholesterol from 7-Dehydrocholesterol through using NADPH [2, 3]. 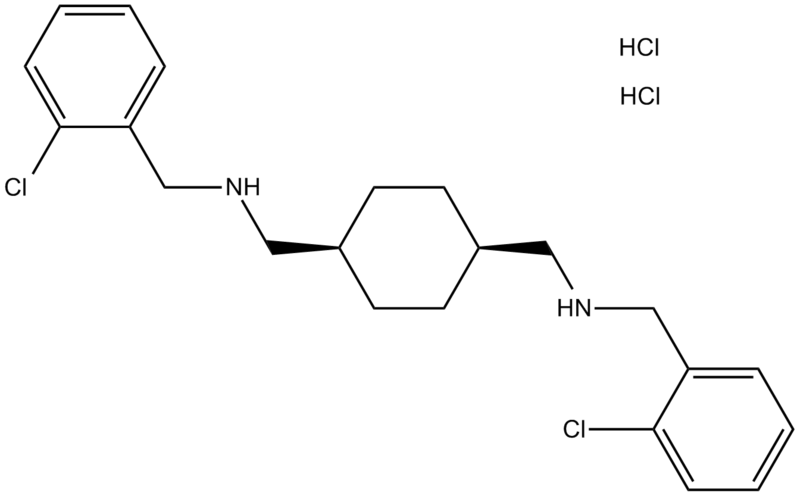 AY 9944 dihydrochloride is a potentΔ7-sterol reductase inhibitor and has higher inhibition thanΔ7-sterol reductase inhibitor BM15766 and triparanol. When tested with Saccharomyces cerevisiae expressed cDNA without an N-terminal 9E10 c-myc epitope (mycD7-ORF) and 5’ noncoding region (D7-ORF), AY 9944 dihydrochloride exhibited highly inhibition on D7-ORF (recombinant humanΔ7-sterol reductase ) with IC50 value of 13 nM . In PBMCs isolated from AIDS patients, AY 9944 treatment exhibited ability to restore the normal mitogenic responses and cytokine profiles . In Sprague-Dawley rats model of Smith-Lemli-Opitz syndrome, administration of AY9944 elevated 7-DHC expression and reduced cholesterol in all biological tissues by inhibitingΔ7-sterol reductase .